The shoulder joint is suspended by many muscles surrounding the upper extremity. The shoulder bones include the clavicle (collarbone), the scapula (shoulder blade), and the humerus (upper arm bone), see Figure 1. The only connection of the shoulder girdle to the remainder of the skeleton is the clavicle. The scapula is an important part of the shoulder joint as it serves as an anchor for many muscles and contains the socket part of the shoulder (glenoid). The upper end of the humerus has a ball-like shape that articulates with the socket, and the humerus also serves as an attachment point for many muscles and tendons. One of the most important is the rotator cuff. Disruption of any of these parts can create difficulty with the function of the shoulder. Shoulder fractures vary by age. The majority of shoulder fractures in children occur in the clavicle. In the adult, shoulder fractures within the upper part of the arm (proximal humerus) occur with increasing frequency with older age. 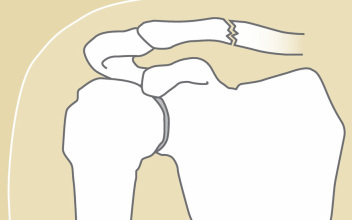 Some shoulder fractures may occur with dislocation of the shoulder joint. 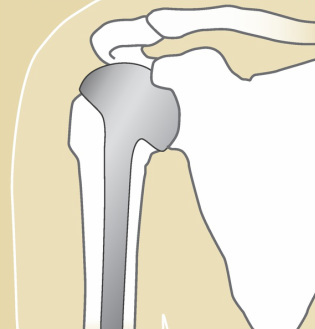 The most common shoulder fracture is of the clavicle, frequently the result of a fall onto the shoulder (see Figure 2). These fractures can be quite painful and cause difficulty in moving the arm. Classically, treatment has been non-operative. Treatment can be a simple sling or a “figure 8” strap, worn for three to eight weeks, depending on one’s pain. Once healed, there may be a bump over the fracture site which may decrease with time, but sometimes a deformity may remain permanently. Range of motion can begin as soon as pain subsides; return to sports cannot occur until full shoulder strength returns. Return to contact sports would be considered only when the shoulder fracture is fully healed on X-ray. Recently, surgical treatment of these fractures has been reconsidered. Surgical treatment options may include plates and screws or even a rod placed into the bone. The consideration of these treatment options depends upon one’s activity level and the dominance of arm use, i.e. a right-handed athlete with injury to the right clavicle versus an older individual not engaged in “overhead” activities. Fractures of scapula or a shoulder blade rarely occur. Usually they result from high-energy trauma, such as motor vehicle accidents or a fall onto the back from a height. Diagnosis of the fractured scapula is often made by X-rays. At times, more definition of the fracture may require a CT scan to assess the displacement of the fracture fragments. Treatment can range from a simple sling for two to four weeks to open surgery. 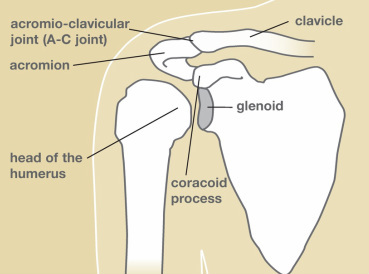 Surgery is more often needed with an injury to the glenoid (shoulder socket) with displacement of the joint surface, the acromion, or the neck of the scapula, the connection of the shoulder blade to the shoulder socket (see Figure 1). These fractures usually occur from a fall onto the arm. In the younger population, these injuries can be simple fractures, often associated with dislocations of the shoulder joint. In those instances, the fracture is often treated by putting the shoulder joint back into place, i.e. reduced. If X-rays show that the fracture is in good position, sling immobilization is often the treatment of choice. If the fracture is out of position, surgery may be recommended. Fractures of the upper part of the arm (humerus) are more common in the older (over 65 years of age) population. Sometimes, there may be no significant displacement of the bone fragments. In other cases, the fracture fragments may be more severely displaced or angulated. Non-displaced humerus fracture can be treated with a sling for four weeks, after which motion can be started. Recovery may require the use of physical therapy to assist in improving motion and strength. For those shoulder fractures with displacement, surgery may be the best treatment option. Surgery may entail repair of the fracture with various devices, such as plates, screws, and wires (see Figure 3). 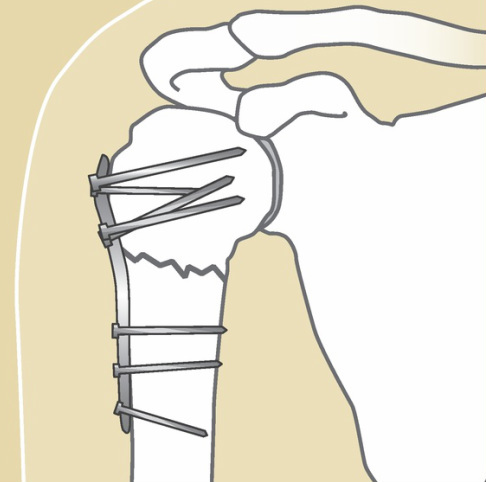 In some cases, the fracture is sufficiently severe that a shoulder replacement may be necessary (see Figure 4). Shoulder fractures often leave one with residual shoulder stiffness regardless of how well the bone was reconstructed or joint replacement performed. The stiffness results from associated injuries to the muscles and tendons as well as the ligaments. With any injury about the shoulder, there are often many different treatment options. Whichever one is chosen to treat your injury, the recovery can be arduous and prolonged. Formal therapy and home exercises are a mainstay of recovery. Your upper extremity specialist will be able to help guide you through to your best result. Figure 4. Replacement of humeral head.